So much production goes into making your wedding as special as possible from behind the scenes, and a big part of that is deciding what the appearance and feel of the wedding will be. Will you go for a classic look? Something a bit more modern and avant-garde? Or will you go totally, unabashedly rogue? These bridesmaid dresses are examples of fashion statements that aren’t the obvious choice (at least, not anymore), and we’re here for it. Bask in the glory of uncoordinated color schemes, design pattern seemingly cut from floral curtains, and outfits so outlandish you’ll wonder if anyone along the way said anything to try to stop them from happening. Remember that scene in The Sound of Music when the children tell Maria they need clothes to play outside in, so she recycles her old curtains and turns them into matching outfits? This gaggle of bridesmaid dresses either had that in mind, or weren’t aware that the joke had already been done before them. To make matters worse, they’ve posed in front of a background that includes floral pattern curtains, underscoring what their outfit really looks like. They could have chosen any other background to take their photograph with and dull down the feeling like you’re actually living inside a flower bouquet. Frankly, it’s a gutsy choice for a wedding photograph. Any bridesmaid must assume a central part in wedding festivities. 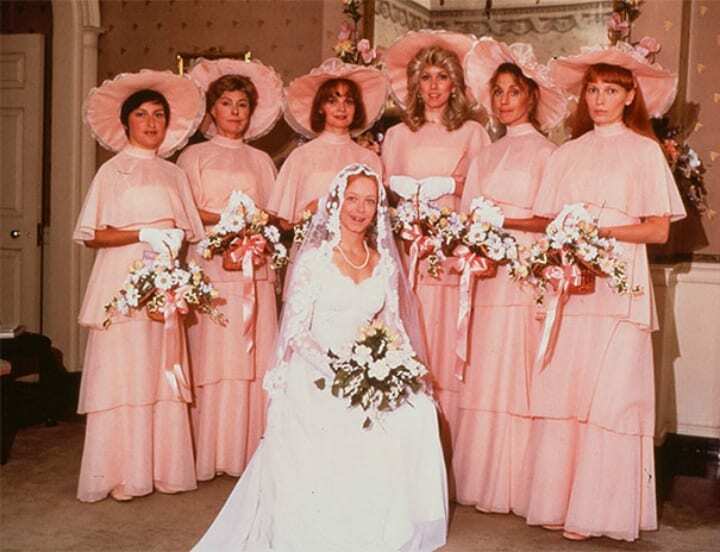 The bride’s BFFs will look wonderful and be present, however it’s common knowledge that despite her crew of lovely ladies, the bride should stand out. As per modern custom, the bride usually decides upon the wardrobe for her flank of friends. 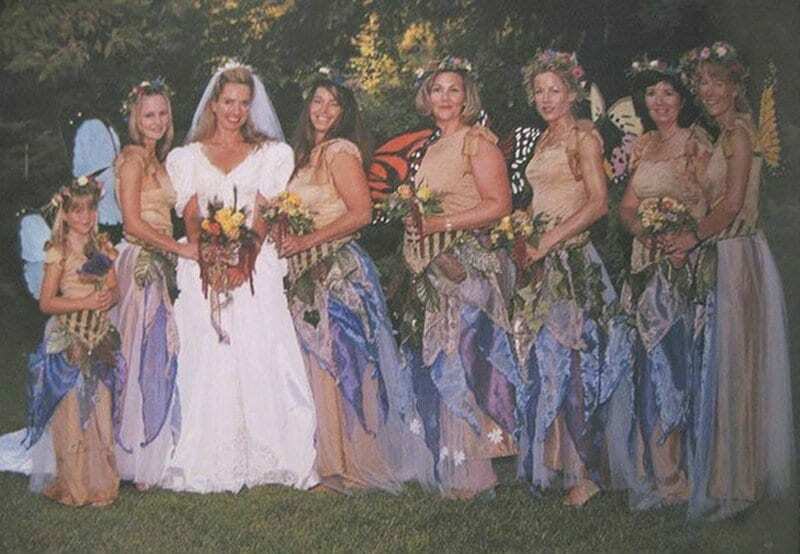 There this rainbow row of ladies is rather curious given that the eye-catching palette of hues draw the focus to anything but the bride. This vintage wedding photo begs the question as to whether this marriage ceremony was held sometime during the Easter season? Complete with matching capes, this technicolor group of gals look like Easter and Marvel combined to become the superheroes we’ve all been waiting for. All in all, we’d call this look modern medieval. Do you have an upset stomach? 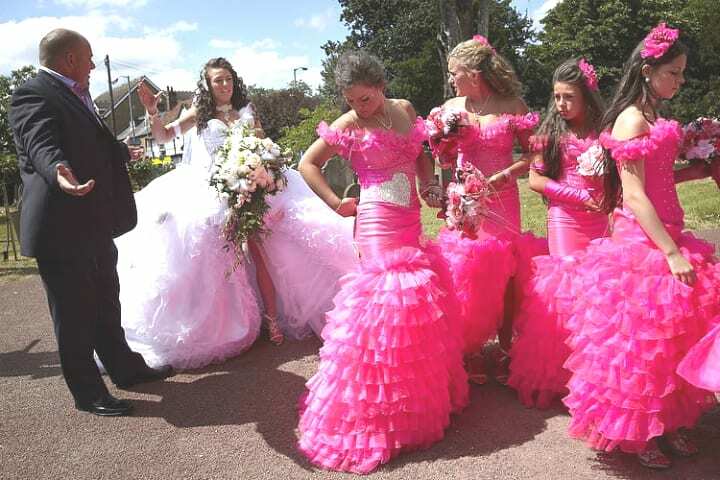 Never fear, your suffering is not in vain, because this group of charming ladies in their Pepto Bismol-colored bridesmaid dresses are here to help soothe your digestive system. Or is it that this particularly unsubtle shade of pink will actually have the opposite effect on those poor wedding guests? The color itself isn’t the only thing that is perplexing about this fashion choice. Whoever designed the headpieces for the bridesmaid outfits has some explaining to do. Why do there appear to be stringy red-tipped mushrooms exuding from the bow? And how many ballerinas were put out of work because their tutus were stolen for the lace piece? A floral arrangement for your bridesmaids, whether it’s a bouquet or an exquisitely-arranged corsage, is a lovely idea – provided it’s done tastefully. Now, to avoid overwhelming the eyes with horrendous floral patterns, it’s best to stick to solid colors. But no, that does not mean you should take poetic license. 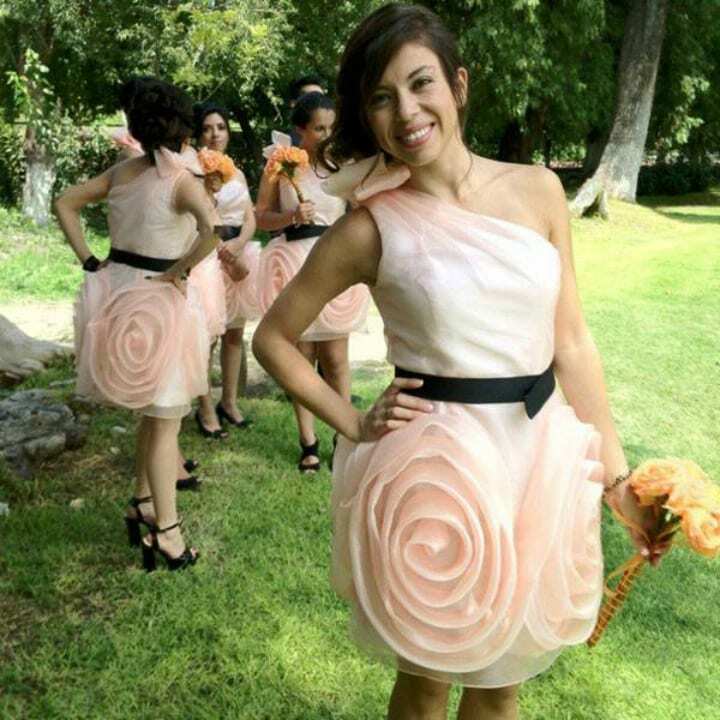 You’d think a giant flower just plopped on the side of a bridesmaid dress would just clash with their bouquets in an over-the-top way, but honestly we can’t decide whether we love this hypnotizing whorl or not. Yes, we understand it is meant to be a rose, but suddenly we’re having an intense hankering for funnel cakes. There’s something about fashion trends in the 1970s that just makes us gape in awe. Apart from the nostalgic sentiments, some of the retro threads make us wonder just what people were thinking back then. 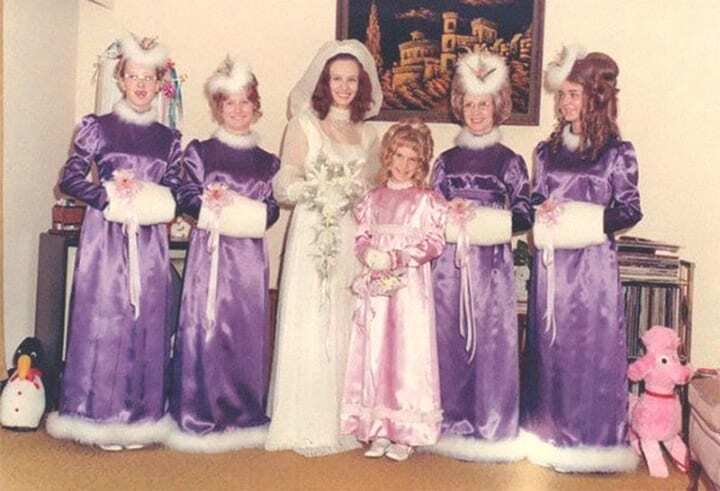 These bridesmaid dresses in lovely hues of lilac and lavender seem to have been made in the most resourceful manner: why bother commissioning dresses when you can just recycle your old satin bedsheets? Those stiff mandarin collars and imposing sleeves are more reminiscent of a nunnery than the happiest moment of this young couple’s life, and those hats might just seem more in place at the Kentucky Derby. 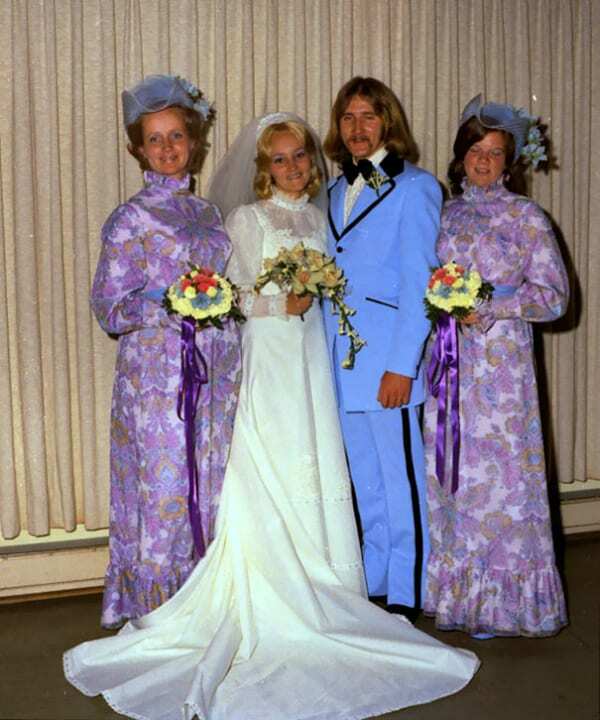 But at the end of the day, we should cut the bridesmaids some slack: check out that proud periwinkle groom. If you see this at a wedding, you might want to slowly back out of the chapel before they bring in the goat and the black candles. 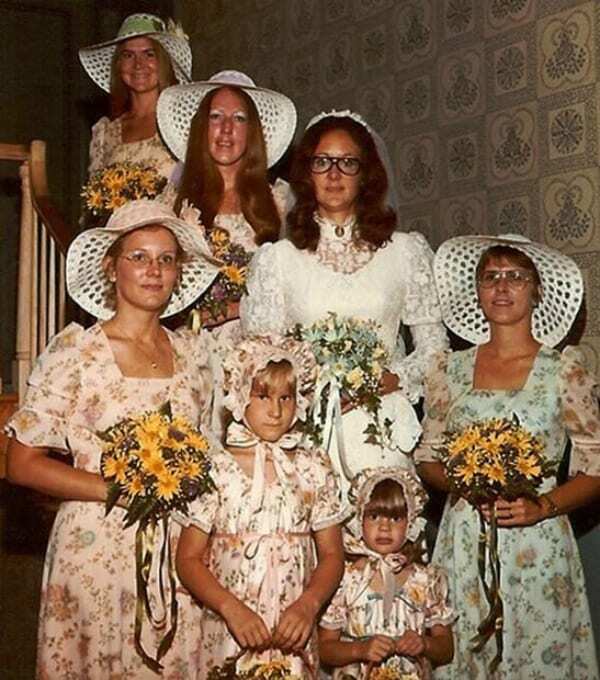 Even Mother Goose herself would be more than a little puzzled at the bonnets on these gauzy ivory bridesmaid dresses, which could likely double as shower caps. 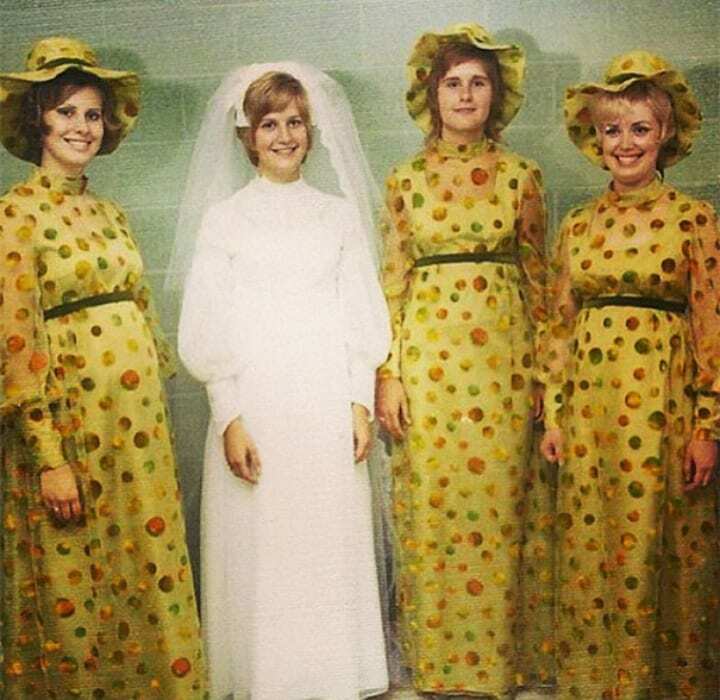 Everything about this unsettling presentation, from the getup and the solemn expressions all the way to that perfectly orchestrated formation the ladies are standing in would leave the viewer convinced that they’re in a procession on their way to a cult ritual rather than a nuptials ceremony. 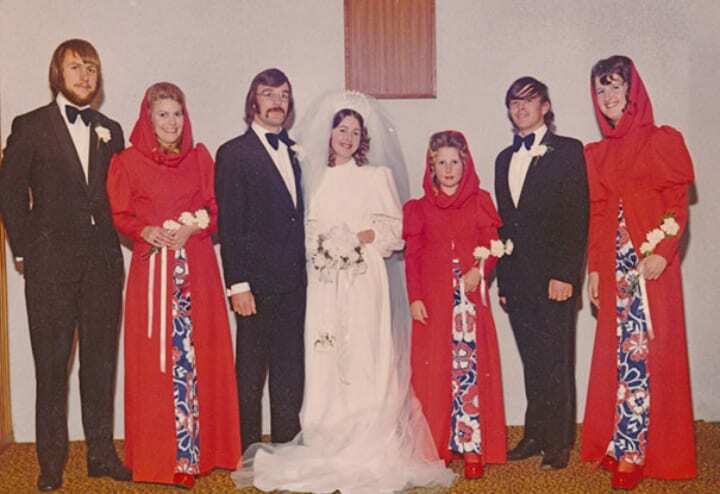 There’s so many slightly disturbing images that these red cloaked bridesmaid dresses conjure up. At best, they’re an homage to Little Red Riding Hood — is the bride’s surname Wolf by chance? They could also be Emperor Palpatine’s Imperial Guards from Star Wars, or of course, late groovy era premonitions of The Handmaid’s Tale. These shockingly scarlet Spanish Inquisition throwbacks and their inexplicably foreboding hoods are what stands out at first, but look closer and these ruby red gowns are replete with a not-so-subtle slit of flower power. Was it particularly drafty in wedding halls decades ago or were hooded downs just another fashion statement that is better left unrevived? The biggest crime about these bold bridesmaid dresses is that not one of these ladies opted to wear a bright red wig to complete the look. If you’re going to go for The Little Mermaid as the theme of your wedding, then go all the way with it, don’t stop short. The designer of these dresses seems to have been deeply inspired by the gentle drifts of kelp forests, if seaweed happened to naturally exist in the color of lime Jell-O. 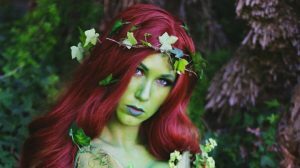 We can’t judge these bridesmaids too harshly though: there’s a fair chance the bride decided to dress up as Ursula – and that would be absolutely fabulous. 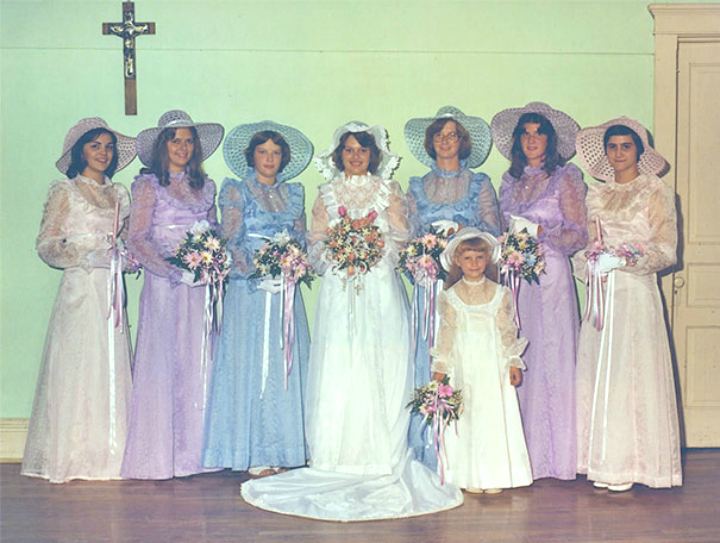 This group of lovely ladies escorting their blushing bride are keeping in line with tradition, because as you surely know, nothing says marriage quite like pea green. Somewhere between a ’50s-style Jell-O mold to a Christmas panettone with pieces of pistachio, these bridesmaid dresses leave us with far more questions than answers. If the goal was to help make sure that the bride would stand out and look extra beautiful by comparison, then this polka-dotted frocks surely achieved it. The dresses would have been outrageous enough, but those goofy Cabbage Patch Doll hats are just the cherry on top of this remarkably odd sundae. Think the dresses so far were outrageous, don’t miss what’s coming next. Did you ever wish your lemon and raspberry ice cream sorbet could come to life? Yeah, neither did we. Sure, bridesmaid dresses can occasionally be drab and repetitive, so it’s totally reasonable to want to have a bit of fun, a bit of flair, and a dash of color. And then there’s this yellow-and-fuchsia soiree. The bold color scheme these proud ladies have decided to use is so bright and unnatural that it’s like they stepped right off the screen from a Disney animated film. They make you wonder who’s meant to be the center of attention at this wedding: them, or the bride herself? 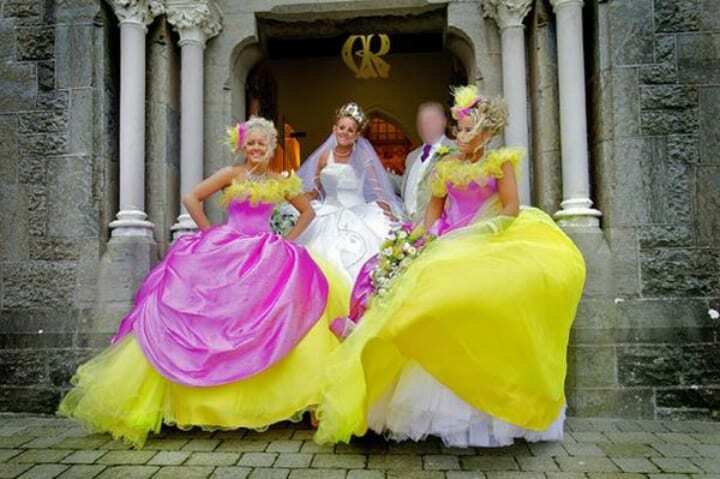 Presaging the trend of Jelly shoes and retro faded color schemes, someone should have had the courage to tell these bridesmaids that their dresses should have been left at the senior prom. Then again, it was probably the 1980s, so anything went and nothing was too tacky to be accepted as trendy. There is something nice about the symmetrical way they have chosen to compose the photograph, according to the color scheme. But what really completes this frilled and ribboned look are those hats, which resemble more of an overturned laundry basket than anything else. Fancy a picnic on the prairie anyone? Drag queens in training, eat your heart out, because these bridesmaid dresses will surely provide costume inspiration for years to come. This shade of fuchsia pink is so unbelievably bright and in-your-face that the wedding party might have needed to pass out shades to the wedding guests as a courtesy. 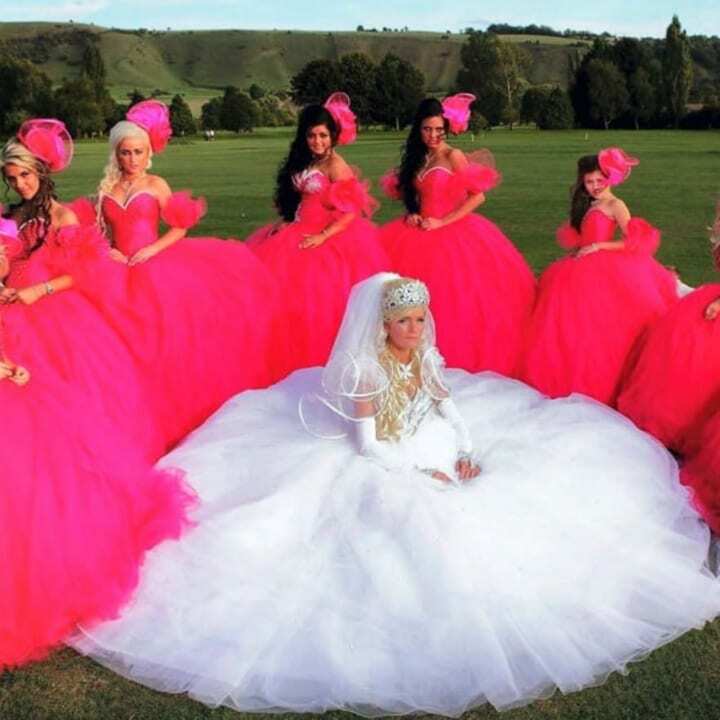 If this was a wedding for lawn flamingos, the color scheme would definitely make sense, but if not, then Malibu Barbie might have a thing or two to say to these ladies who could definitely giver her a run for her money. This is why it’s important to be precise with designers when it comes to choosing a colors scheme; if you just say ‘pink’, this just might be what you’ll end up with. From head to toe, to the very composition of this wedding photo itself has us staring. It remains one of the greatest mysteries in the world as to how nobody behind the scenes spoke up and gently told these ladies to maybe tone it down a little bit. If you want to dress in a cassock, the best opportunity for it is probably Halloween, not your gal pal’s big day. Then again, the bride probably had a lot to do with this lavender look. That fur trim is less haute couture, and more Santa Claus. Wild hairstyle choices aside, what on Earth is going on with those fuzzy headdresses? Even the stuffed animals that for some reason have been crammed into the frame to pose for the photo with the bridal party seem a good deal perplexed. Move aside, Catelyn Stark, there’s a new red wedding in town. 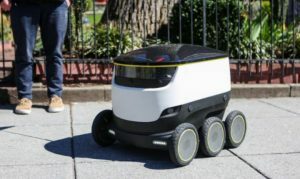 It’s like all of Owen Wilson and Vince Vaughn’s puerile fantasies in Wedding Crashers have coalesced into one perfect prototype. At least if these bridesmaids spill any red wine — you know it’s inevitable — it wouldn’t show. The biggest and most sobering question at hand is, who is that dour and comparatively understated lady on the left, and why is her dress different from this proud procession of leggy bridesmaid dresses? Is that, in fact, the bride herself? We’re sensing rouge was the theme, but overkill anyone? 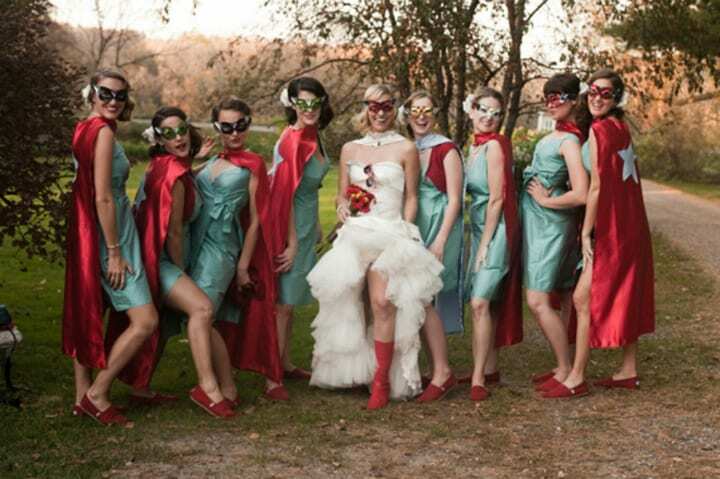 At least these crimson-clad bridesmaids didn’t have to tower in high heels all night. Skydiving glasses and all, this bride is looking lovely and all laced up for her big day. 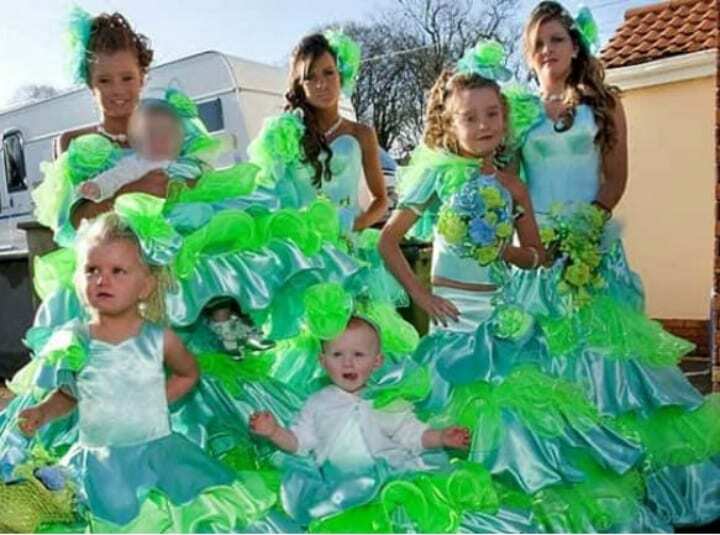 But those bridesmaid dresses sure do leave something to be desired. It’s as if Laura Ingalls Wilder designed wallpaper, let it get discolored from tobacco smoke, peeled it off, and made an outfit out of it. Hats with that many holes in them not only defeat the purpose of practical head ware but are bound to tip off any unfortunate wedding guests’ trypophobia. And what designer looks at pictures of the American Revolution and thinks colonial bonnets ought to be considered an acceptable accessory anywhere outside of a historical reenactment site, let alone for a wedding? Thankfully, this beaming bride has just the right wedding dress train to flaunt in front of her that ever so slightly allows her to edge out her competition. But that being said, it’s a heck of a contest to see who will take the spotlight on her wedding day, with those colorful bridesmaid dresses. It appears as if they sat down to conceptualize it and decided that yes, any and all of the pastel colors would be just perfect, with no boundaries whatsoever. To give this look even more variety than it already has, none of the patterns on the dresses match each other, even though the general concept was long sleeves and long skirts! It’s hard to decide which song first comes to mind in regard to this buttery ensemble: Coldplay’s “Yellow,” or the theme song to The Simpsons. Ladies, the recipe for the meringue called for lemon zest, not the whole entire orchard. They’re so bright, you might think they were walking on sunshine. But wait a second, isn’t this meant to be a wedding, the happiest day of this bride’s life? 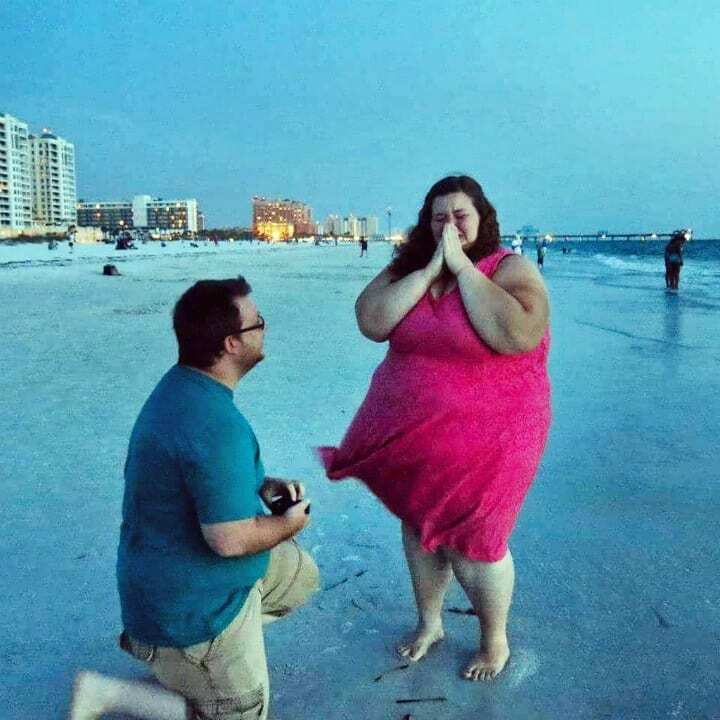 Shouldn’t her friends and bridesmaids be sharing in that joy? 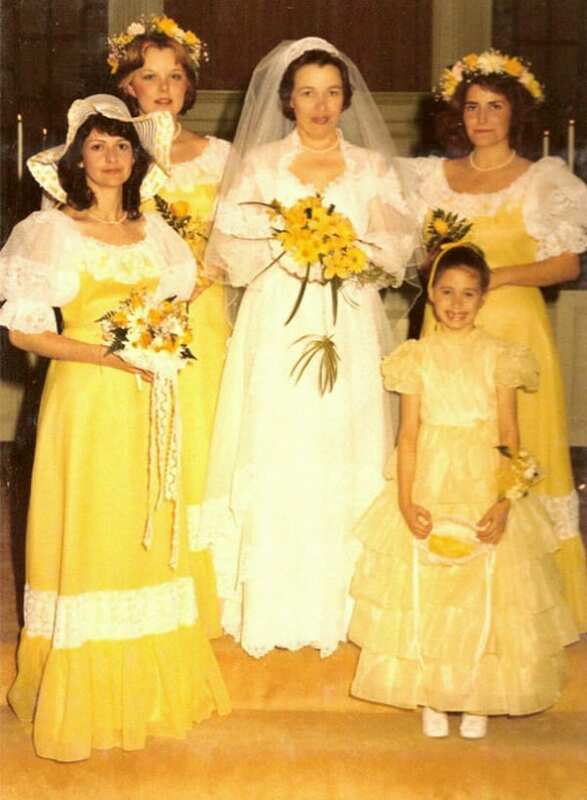 Clearly, the only person in this picture who’s actually enjoying being in those yellow dresses is the little flower girl. 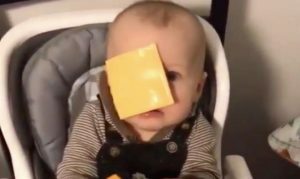 Ah, the innocence of youth. 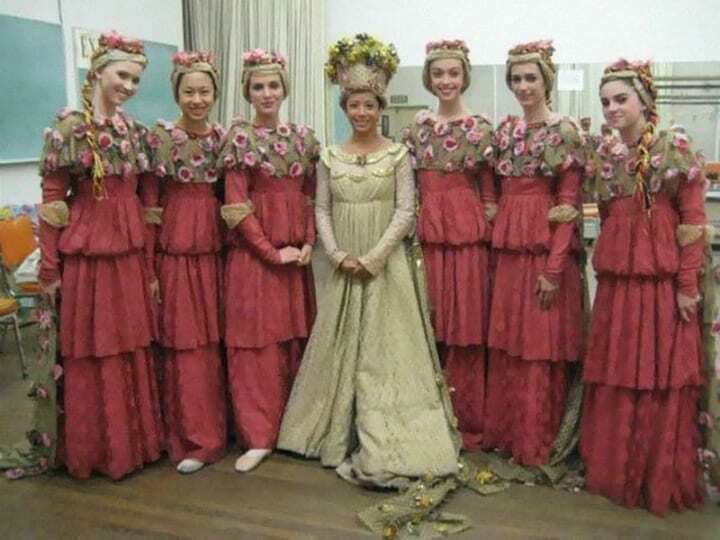 The extras from Spamalot apparently took some time off from rehearsing their chorus numbers to give this bride some well-needed cheer. That’s not what actually happened, of course, but it certainly would be a convenient excuse, because absolutely nothing is clear as to what’s going on at this wedding. From the curtain-like pleats to the floral encrusted chest fabric and the headpieces reminiscent of wicker flower pots on these bridesmaids, we’re sure there had to be a compelling story as to why this bride all decked out in muted lime opted for a shrubbery-theme ceremony. Apparently the traditional bouquet wasn’t enough here. First things first: isn’t that lady on the right with the stone-cold expression just the spitting image of actress Mia Farrow? And now, onto this choice of bridesmaid dresses: the Edwardian era called, they want their dresses back. It’s not necessarily the salmon color that’s off-putting. For starters, that priestly collar isn’t exactly advertising a whimsical feel. But what’s most likely to strike your nostalgic funny bone are those pleated umbrella hats they’re wearing. 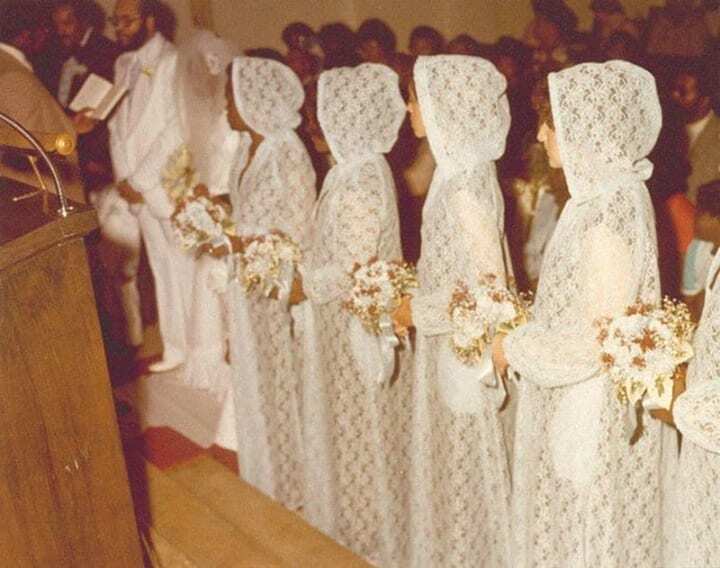 If you’re going to cover your bridesmaids’ heads, maybe make it a different color than the dress so it isn’t as overwhelming — and maybe try to make it just a little less reminiscent of The Flying Nun! If this bridesmaid dress design conjures all kinds of memories of the bygone trends from yesteryear that you don’t miss, don’t miss these last couple of photos! 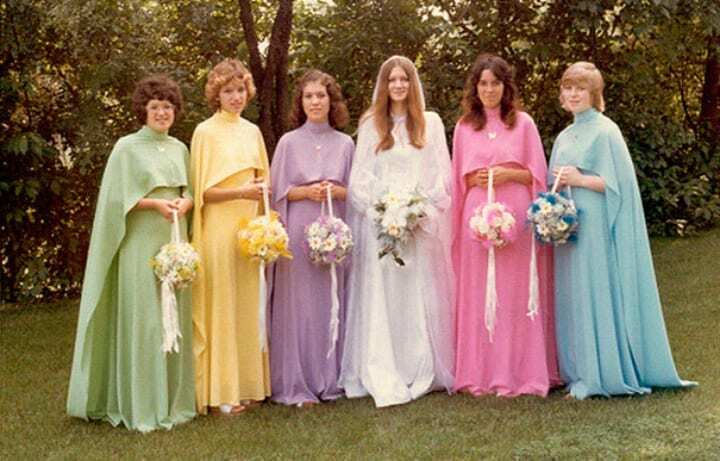 The color of these bridesmaid dresses is what happens when you’re having a gander at your toothpaste in the morning and suddenly get a whiff of minty fresh inspiration. 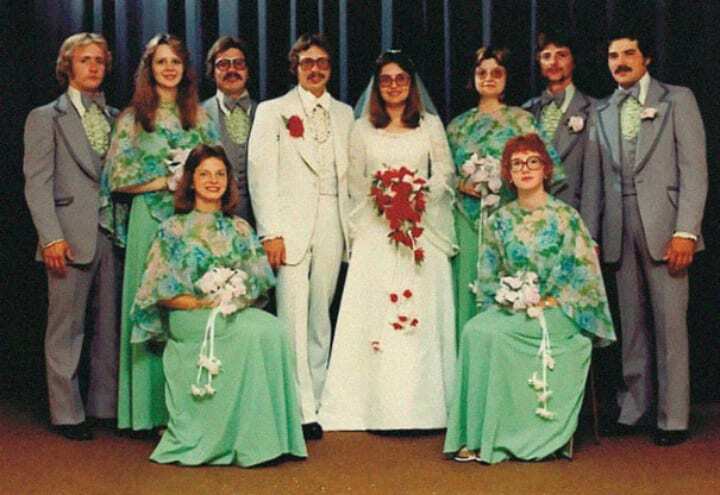 But as your eyes glaze across the joyful backdrop of this awkward wedding photo, slowly it dawns on you that those dresses should be the least of their concerns. 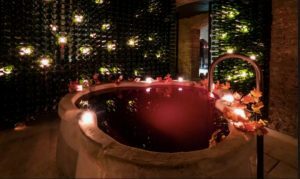 This photo brings back just so much nostalgia for entire parties filled with coordinated enormous-framed rose-tinted glasses, said no one ever, with the exception of the most ardent hipster. And while we’re at it — it would appear that Barb from Stranger Things has at long last been found, all in one piece! 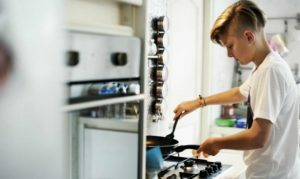 Sure, there’s something to be said for bridezillas, as well as making sure that the bride’s vision for her wedding day materializes. It’s common for people to incorporate tidbits of a personal symbolism on wedding decor and attire, but it appears that his bride decided to take a very blunt approach in that regard. Looking like a wayward troupe of actors on their way to Shakespeare In The Park’s production of A Midsummer Night’s Dream, there’s so many fashion faux pas here as to make one’s head spin. But the most important element of it all is, despite how it looks, they all seem to be enjoying themselves! Great for a costume party, but how do you pull this look off for a wedding? 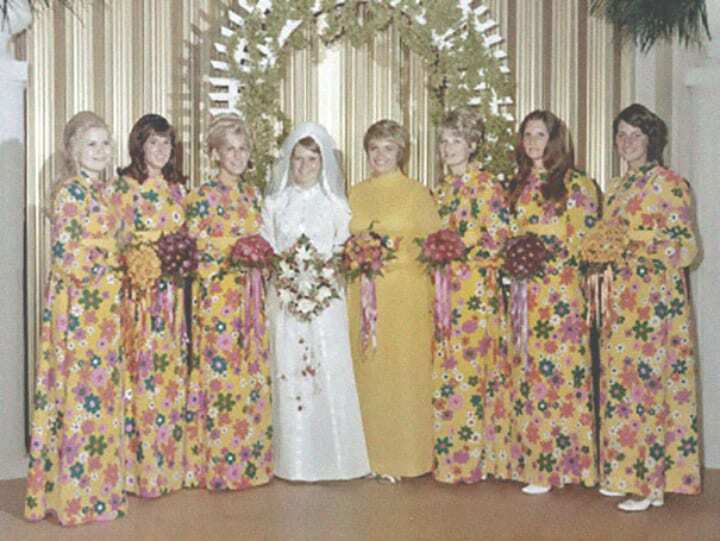 ‘Funky’ must have been the inspiration for the designer who apparently though it would be lovely if it rained psychedelic flowers all over these retro bridesmaid dresses. Their hair-dos are all to die for, but staring too long on those busy frocks can do a number on you. 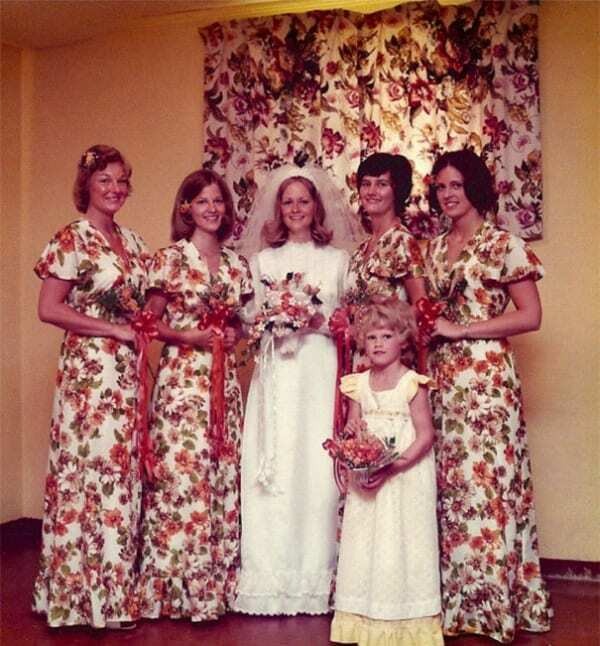 We get it, it was the 1970s, people were still enjoying the Flower Power vibe of the previous decade, and mind-altering motifs were still very much en vogue. 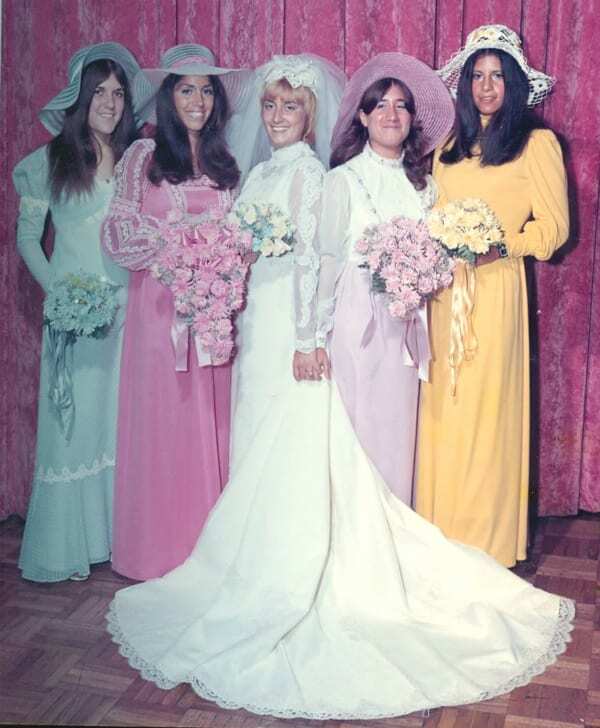 But don’t these bridesmaid dresses look more suitable for a backdrop on The Dating Game than, say, a ceremony of holy matrimony? 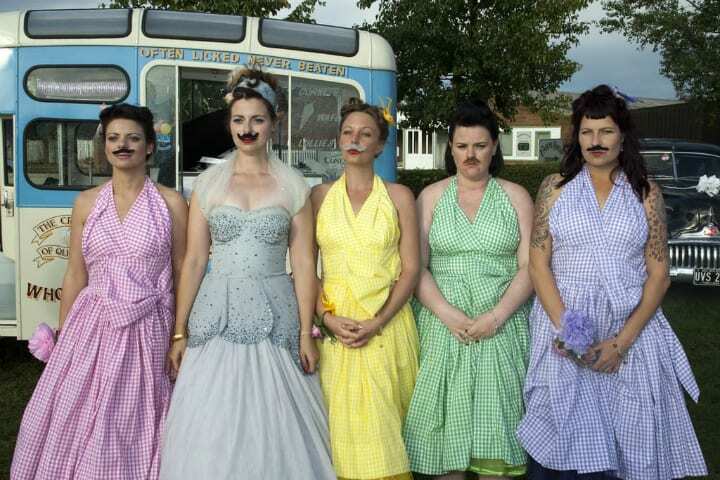 It’s an unusual look for a wedding, but these women deserve credit for being unique. 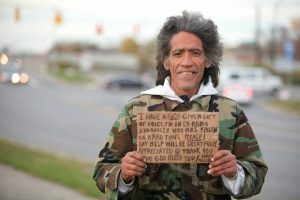 They have taken their theme and run with it, with not a grain of shame. And if you’re going to dress up like caped crusaders for your gal pal’s big day, you had better commit to your role as best as you can. 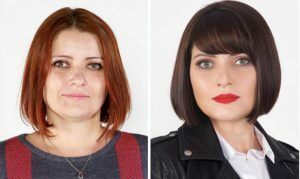 There’s something to be said for the amount of guts these women have for pulling off this look, but no matter how wacky it is, something about it works so perfectly. They all seem to be having an absolute blast, and that’s precisely what your friend’s wedding day ought to be all about. Fierce tattoos? Stoic expressions? 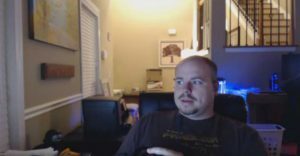 Comedic mustaches? Checkered patterns? By golly, this seems to be the perfect solution combing bridesmaids and groomsmen into one what was undoubtedly one of the quirkiest weddings on record. The levels of unabashedly embraced irony are simply off the charts – and so are the bold colors of checkered fabric to tailor this original series of bridesmaid dresses. Even if they look like walking picnic tables, and not all of them are even coordinated with one another, these ladies don’t look displeased. They’re gladly hamming it up for the cameras, glowering with all the deliberate seriousness they can muster. They’d better hurry with the photo shoot though — wouldn’t want to be late for craft beer and a concert on ukuleles and spoons!